Also known as Valley Fever or “cocci”, coccidioidomycosis is caused by a fungus that lives in the desert soil of the southwestern United States (US), California, and Mexico. It was first discovered in the San Joaquin Valley of California, but it is also found throughout the Sonoran Desert. The fungus is dimorphic and only the spore-forming phase can cause infection by inhalation. There are two species of the fungus that are clinically indistinguishable. Manifestations of coccidioidomycosis infection range from clinically asymptomatic to life threatening. Progressive pneumonia and dissemination occurs in approximately 1-3% of patients. Coccidioidomycosis is not transmissible from person-to-person contact and in hospitalized patients, and does not require contact or respiratory isolation. Confirmation of clinically significant coccidioidomycosis infection is made based on clinical features as described below, a history of travel to or residence in the endemic areas and diagnostic studies to be described in detail below. Coccidiosis pneumonia will often present with fever, cough, fatigue, and headache, and is clinically indistinguishable from bacterial causes of community-acquired pneumonia (CAP). In endemic areas, cocci may account for up to 25% of CAP diagnosis. It should always be under consideration for the causative agent in these areas. Often, patients with cocci are treated with antibacterials for other causes of CAP and still improve as a result of the natural history of most of these fungal infections. More complex infections may develop exudative pleural effusion. Approximately 5-15% of cocci pneumonia infections will do so. However, pulmonary cavities and nodules, if present, are signs of natural progression of pneumonia. Nodules likely will not require treatment; cavitary lesions often will. Skin manifestations such as erythema nodosum or erythema multiforme may be present and do not signify dissemination (though dissemination to skin is described below). These rashes are due to robust immune response to the fungus and are considered a favourable prognostic sign. Patients may also present with lymphadenopathy, most often in the supraclavicular area. Arthralgias may be present, a phenomenon that has been called “desert rheumatism”. Eosinophilia is another prominent feature. The presentation of disseminated disease will depend on the location of infection. Cocci meningitis presents with headache, often chronic, with or without neurological deficit, but when present, often includes cranial nerve palsies. Cerebrospinal fluid (CSF) in these patients typically has high protein, low glucose, and often has eosinophilic pleocytosis. Bone and joint infection usually presents with pain and swelling in the area of infection. Vertebral osteomyelitis will typically present with localized back pain with or without fever, and possible neurologic deficit, depending on location. 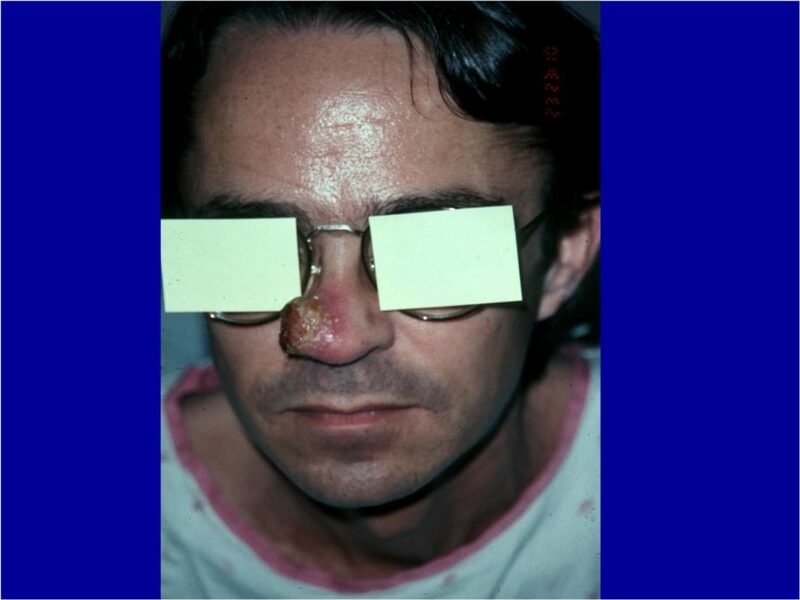 Dissemination to skin may appear as a non-healing plaque with central crusting (Figure 1). Peritoneal cocci, though very rare, presents with ascites and abdominal pain, often with weight loss and can be mistaken for intraperitoneal cancer. Obtaining a travel history is critical to making the diagnosis. Clinically insignificant coccidioidomycosis is so ubiquitous in endemic areas, it is uncommon to see a negative titer in natives of those areas. Pulmonary coccidioidomycosis can affect anyone who lives in or has traveled to an endemic area. Dissemination occurs in approximately 5% of cases and is more common in African-Americans and those from the Philippines, pregnant women in the third trimester, and patients who are immunocompromised: human immunodeficiency virus (HIV), post-transplant or others taking immunosuppressants such as chronic steroids or tumor necrosis factor (TNF) alpha inhibitors. Patients with diabetes mellitus, autoimmune diseases, and other comorbidities are also at higher risk of mortality. These patients require careful ongoing assessment and management. As another “great imitator”, cocci can mimic many other diseases, depending on the location. As mentioned above, case reports have described cocci in virtually all organs. History of travel to the southwestern US, Mexico, or California should alert the clinician to perform diagnostic tests for coccidioidomycosis. As above, cocci pneumonia can range in presentation from mild crackles on lung examination to pleural effusion or respiratory failure. Meningitis presents as any other, but usually is more chronic in nature. Skin exam may reveal erythema nodosum. Other physical findings are based on the location of involvement. Chest x-ray (CXR) or, if needed, computed tomography (CT) scan will demonstrate the pulmonary manifestations which may include infiltrate, effusion, cavitary lesions, mediastinal lymphadenopathy, etc. (see details under Imaging section below). Lumbar puncture, joint aspiration, skin scrapings or biopsy, paracentesis, and thoracentesis are all reasonable tests based on presenting signs and symptoms. Visualization of cocci spherules under direct microscopy is diagnostic. Fungal culture of body fluid may be performed, but will not rule out cocci if negative. Complete blood count (CBC) with differential – particular attention should be paid to the presence of eosinophilia. Papanicolau smear showing ruptured spherule full of endospores spilling into surrounding tissue. H&E and silver stains will also easily demonstrate spherules. Serology should be performed in experienced laboratories. IgM turns positive approximately 1-3 weeks after exposure, IgG turns positive after approximately 3 weeks. The rate of false positive IgM for EIA is quite high, so it is considered a “screening” test, requiring confirmation using IDF, which has higher specificity. EIA is resulted within 24 hours, while IDF takes approximately 5 days. Fungal culture usually turns positive within 1 week. Quantitative IgG is important for monitoring treatment and has prognostic value. CXR (even if presenting as meningitis or other non-central nervous system [CNS] dissemination): An infiltrate is most commonly seen, often with hilar adenopathy. As mentioned, pleural effusion, cavitary lesions or nodules may also be seen. CT head scan prior to lumbar puncture (LP) if focal neurologic deficits are present. Bone scan or magnetic resonance imaging (MRI) with gadolinium if there is concern for bony involvement. A common problem in endemic areas is the evaluation of a pulmonary nodule seen on CXR or CT scan after known (or unknown) cocci infection. In the setting of cocci, further surveillance of a nodule is not generally necessary (Figure 3). 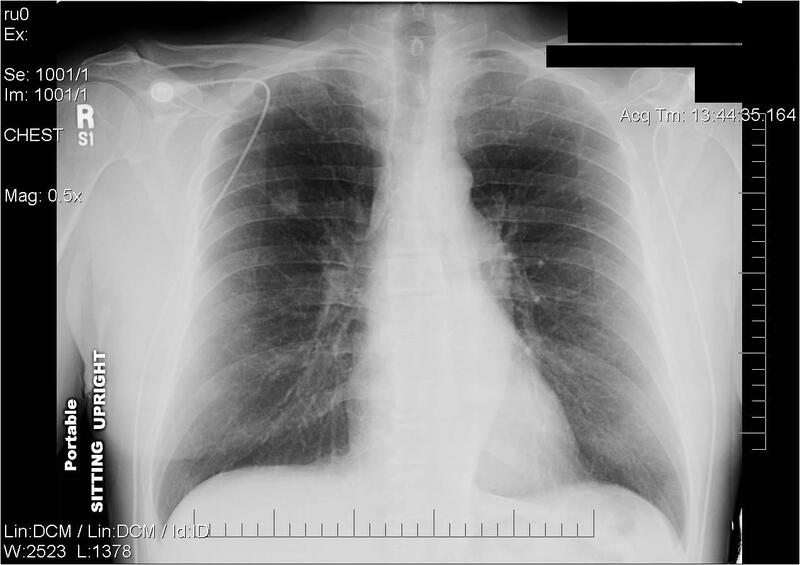 Chest x-ray showing pulmonary nodule in right upper lobe. Biopsy consistent with coccidioidomycosis spherules. Note high rate of false-positive EIA IgM, requiring confirmation with IDF. There is no need to treat clinically insignificant disease, diagnosed only by serologies. The decision to treat cocci pneumonia should be based on clinical features: hypoxemia, large infiltrate or effusion, weight loss of greater than 10%, persistent symptoms greater than 2 months, age greater than 55, other patient characteristics (see risk factors described above), and titers. Titers greater than 1:16 are generally thought to be more likely to disseminate. Treat with fluconazole 400 mg daily or itraconazole 200 mg twice a day for 3-6 months, but this may need to be longer or with higher dose depending on severity and risk factors for dissemination (see above). Disseminated disease mandates treatment, depending on location and patient comorbidities. Third-generation oral azole antifungals are first-line management in most cases and none is superior to any other in all cases. Fluconazole and itraconazole are generally well tolerated and have excellent bioavailability. In cases refractory to initial treatment, voriconazole and posaconazole have been used, however side effects and cost are significant barriers to their use currently. Fluconazole is the preferred agent in treatment of cocci meningitis. Bony infection seems to be more effectively treated with itraconazole over fluconazole, but has not been directly compared with ketoconazole. Initial doses are often higher than those used for cocci pneumonia, ranging from 400-1200 mg daily. Amphotericin B, the original treatment for cocci, is still widely used to treat complicated patients, especially in HIV, pregnancy, or in case of azole failure, but requires very close monitoring for side effects, toxicity, etc. There are two formulations of amphotericin B. The deoxycholate amphotericin B (AmBisome) dose is 0.5 mg/kg (up to 1 mg/kg) intravenous (IV) daily and the lipid amphotericin B (Abelcet®) dose is 5 mg/kg IV daily. The lipid formulation is thought to be less nephrotoxic, though both have significant side effects, to be discussed later. Both sequential and combination treatment with amphotericin B and an oral azole have been used with some success. Cocci meningitis requires lifelong monitoring and treatment due to an extremely high relapse rate (78%) with discontinuation of treatment. Non-CNS cocci dissemination requires treatment for at least a year, with further treatment guided by symptoms and CF titers. Consider the role of surgical treatment in selected cases, including vertebral osteomyelitis with impending spinal cord impingement, large abscess, or pericardial disease. In most patients with any non-CNS cocci infection, the relapse rate is low enough that an attempt to discontinue treatment at some point is appropriate. In a patient strongly suspected of having acute cocci pneumonia, treat as CAP, including blood cultures for bacteria and fungus and timely initiation of antibiotics and antifungals. The patient may require oxygen supplementation and even immediate intubation and ventilation, depending on severity of disease. Thoracentesis may be necessary and a sample should be obtained for microscopy and fungal culture. In cocci meningitis or vertebral osteomyelitis, immediate management should address neurologic function, obtaining diagnostic testing, etc. Most other manifestations of cocci generally present in subacute to chronic stage and would not require specific emergency measures. Cocci pneumonia: monitor respiratory status and look for improvement in hypoxia. Cocci meningitis: monitor for changes in neurologic function. CF titers should be checked approximately every 3-6 months, depending on clinical status to monitor response to treatment. In addition, it is reasonable to obtain CBC and complete metabolic profile (CMP) every month or so while on fluconazole. In cocci meningitis, repeat CSF examination may be helpful if symptoms do not improve or if there is concern for another etiology of neurologic deficits. Clinically significant coccidioidomycosis infections require long-term follow-up for years to monitor for relapse and dissemination. The patient should be followed by a specialist in infectious disease (ID) if possible for management of medications and laboratory monitoring. Approximately 15% of cases will relapse after discontinuation of antifungal therapy. It is unlikely however, that longer duration of treatment protects from later dissemination. Consultation by an ID specialist to assist with management may be helpful, especially if there is disseminated disease or if practicing in a non-endemic area. Infectious Diseases Society of America (IDSA) guidelines suggest early initiation of antifungals in all cases, however those who practice in endemic areas generally endorse treatment as the clinical picture dictates. 200-1200 mg per os (PO) daily. Side effects: rash, headache, alopecia, hepatotoxicity, and rare long QT prolongation. Side effects: black box warnings for heart failure, multiple drug interactions, and arrhythmias (in addition to the above). Amphotericin B deoxycholate (AmBisome) 0.5 mg/kg (up to 1 mg/kg) daily. Amphotericin B liposomal (Abelcet®) 5 mg/kg daily. Side effects: acute infusion reactions including fever, shaking chills, hypotension, anorexia, nausea, vomiting, headache, and tachypnea. Premedicate with IV fluids (IVF), acetaminophen, diphenhydramine, and meperidine (for rigors). Other side effects: nephrotoxicity (more associated with deoxycholate formulations), hypokalemia, and anaphylaxis. Dosage adjustments are necessary for oral azoles. Close monitoring and nephroprotective strategies should be used with amphotericin B. Dose adjustment may be necessary if renal insufficiency is caused by the drug. Use caution with oral azoles. Heightened awareness of potential for dissemination. May consider cocci prophylaxis with fluconazole 100 mg PO daily in endemic areas. Monitor closely for anemia, neutropenia, and thrombocytopenia. Length of stay is typically 3 days for an uncomplicated patient, though a longer length of stay may be required in a patient with a complicated course. The patient is ready for discharge when symptoms are improving and there is stable respiratory status. Follow normal wound care if postoperative. Discharge planning must address logistics involved with amphotericin B if needed: peripherally inserted central catheter (PICC), skilled nursing facility (SNF) for daily infusion and premedication, follow-up laboratory tests, etc. Ensure there is a process for laboratory results to be communicated to the primary care physician (PCP) or ID (or both). PCP within 2 weeks for repeat laboratory tests and medical management. ID specialist within 1 month and approximately every 3-6 months thereafter for laboratory tests, clinical status and repeat imaging as needed. As above, if patient is on amphotericin B, SNF will likely be necessary for daily premedication with infusion. Ensure follow up with ID with process for communication to occur between physicians and patient regarding symptoms, laboratory tests, etc. Adam, RD,, Elliott, SP,, Taljanovic, MS. “The spectrum and presentation of disseminated coccidioidomycosis”. Am J Med 122. 2009. pp. 770-777. Galgiani, JN,, Ampel, NM,, Blair, JE,, Catanzaro, A. “Coccidioidomycosis. IDSA Guidelines”. Clin Infect Dis. vol. 41. 2005. pp. 1217-1223. Kuberski, T,, Herrig, J,, Pappagianis, D. “False-positive IgM serology in coccidioidomycosis”. J Clin Microbiol. vol. 48. 2010. pp. 2049-2047. Merchant, M,, Romero, AO,, Libke, RD,, Joseph, J. “Pleural effusion in hospitalized patients with coccidioidomycosis”. Resp Med 102. 2008. pp. 537-540. Parish, JM,, Blair, JE. “Coccidioidomycosis”. Mayo Clin Proc. vol. 83. 2008. pp. 343-348. Saubolle, MA,, McKellar, PP,, Sussland, D. “Epidemiologic, clinical, and diagnostic aspects of coccidioidomycosis.”. J Clin Microbiol. vol. 45. 2007. pp. 26-30. Spinello, IM,, Munoz, A,, Johnson, RH. “Pulmonary coccidioidomycosis”. Sem Respir Crit Care Med. vol. 29. 2008. pp. 166-173. Stockamp, NW,, Thompson, GR. “Coccidioidomycosis”. Infect Dis Clin N Am. vol. 30. 2016. pp. 229-246.